He has been detained on suspicion of using a false invoice to claim mobile phone expenses. FORMER FIANNA FÁIL TD Ned O’Keeffe has been arrested over accusations that he used a false invoice to claim for mobile phone expenses while he was a member of the Dáil, RTÉ has reported. Gardaí confirmed to TheJournal.ie that an arrest had been made in Cork and that the man is being detained in Cobh Garda Station. A spokesperson for Fianna Fáil told TheJournal.ie that the party would not be making any comment on the issue at the moment as it is a “matter for the Gardaí”. O’Keeffe served as a TD for Cork East from 1982 until the last Government was dissolved on 25 February 2011. While in government, he became a junior agriculture minister but lost the Fianna Fáil party whip in November 2007 over a row about a health policy motion. He was reinstated three months later. 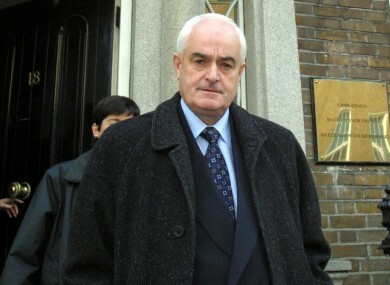 On retiring after 29 years in politics, O’Keeffe has been entitled to an annual pension payment of over €65,000. Consistently controversial, the former pig farmer is well-remembered for trying to ban the film Babe in 1995 in case it caused harm to Christmas ham sales. He also sparked a furious reaction from Cork people back in 2009 when he voiced his support for nuclear power and the establishment of an incinerator at Cork Harbour. Before leaving Government last year, he was openly critical of the Brian Cowen-led Cabinet, telling Today FM’s Matt Cooper that it was too full of “intellectuals”. He also said that Ireland could face a military coup over its economic plight. In September 2011, the Irish Mail on Sunday claimed that Dáil authorities had been told that at least three of his mobile phone expense claims – worth thousands of euros – were based on fake invoices. Email “Former FF TD Ned O'Keeffe arrested”. Feedback on “Former FF TD Ned O'Keeffe arrested”.